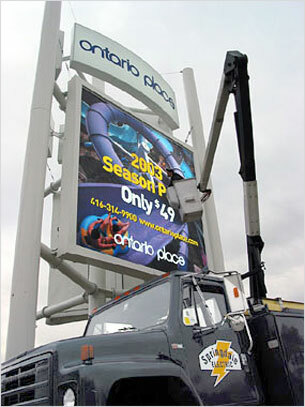 Springdale Electric has become a well known contractor having designed, installed and maintained the lighting and power systems for hundreds of eye-catching outdoor signs across the GTA and surrounding area, including two larger projects: the Niagara Falls Aviary and a pharmaceutical plant in Markham, Orbus Life Sciences Inc.
From signs designed to catch the eye on major highway routes to others at entertainment venues such as Ontario Place, SkyDome and Woodbine Racetrack where we did the installation of the scoreboard lighting. Springdale has also completed the roof signs at Toronto's downtown Hard Rock Cafe location and the media tower for Clearchannel across the street, as well as various other highly noticeable sites in the city. 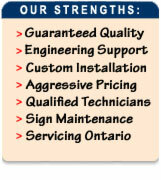 Serving outdoor signs for over a decade, Springdale Electric has developed a loyal following of clientele who have come to rely on us for our electrical expertise and experience. NEW: Starting in 2011, we have developed various LED Lighting Solutions to help our clients conserve energy by participating in the Ontario government’s saveONenergy initiative. Call us for more info. For world-class, energy-saving displays and signs, we can power your imagination and let your ideas see the light! Copyright © 2011 Springdale Electric. All rights reserved.